LPC LAHORE: Six-star Saqib Khan Khakwani steered Allied Bank to title victory in the Samba Bank Lahore Open Polo Championship 2017 here at the Lahore Polo Club (LPC) ground on Sunday. 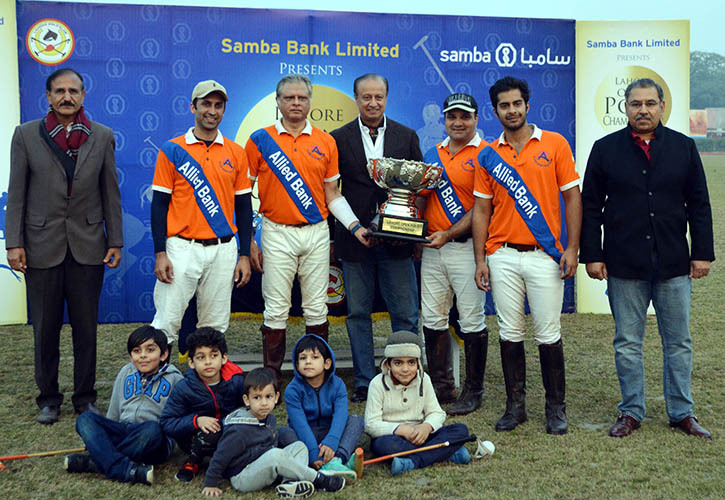 Allied Bank played outstanding polo and outclassed Black Horse Paints by 9-4 in the main final. Saqib was star of the day for Allied Bank with his sterling six goals while Raja Arslan Najeeb scored a brace and Mumaz Abbas Niazi contributed one. All the four goals from Black Horse Paints came from Hissam Ali Hyder but his heroics couldn’t help his team register victory. The first chukker of the final was evenly poised as one goal each was scored by both the teams to make it 1-1. Allied Bank then stamped their authority in the second chukker and thwarted three tremendous goals to take 4-1 lead while one goal was converted by Black Horse to reduce the deficit to 4-2. Allied Bank then fully dominated the third chukker, pumping in three more goals to take healthy 7-2 lead. In the fourth and last chukker of the final, Black Horse though bounced back and banged in a brace to reduce the margin to 7-4 but two more goals were struck by Allied Bank to finish the match having 9-4 lead. Major Omer Minhas and Eulogio Celestino supervised the match as field umpires. Habib Metro Lions/Master Paints defeated Army by 5-4 in the thrilling subsidiary final as the match was decided in the fifth sudden death chukker. Hamza Mawaz Khan hammered a hat-trick while Edward Banner stuck the remaining two goals. From the losing side, Luis Mighal Duggan scored a brace and Maj Omer Minhas and Maj Faizan Tasadduk slammed in one goal each. Agha Murtaza Ali Khan and Ahmad Khan were the field umpires.